Welcome to the Acadia National Park Information Guide. In 1913, President Woodrow Wilson set aside 6000 acres (within what is now Acadia National Park) as Sieur de Monts National Monument. With the acquisition of more land and private support and funding, in 1919 President Wilson signed an act establishing Lafayette National Park. In 1929 the parks name was changed to Acadia. 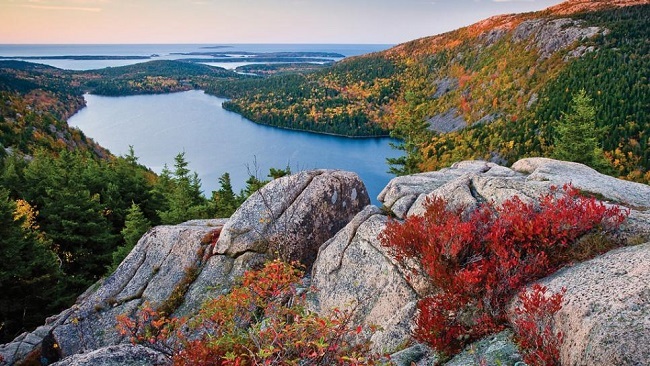 Acadia National Park was established to protect the area’s spectacular scenic values, Maine’s rock bound coast, its coastal and its offshore islands as characterized by the geologic features, natural history and the native plant and animal life. Who built the carriage roads? Who had the vision of a national park on this popular vacation coast land? This national park is unusual because it was neither carved out of public lands nor bought with public funds. It was envisioned and donated through the efforts of private citizens. Many people loved Mount Desert Island, Schoodic Peninsula and the nearby islands. Maine residents and summer visitors alike donated their time and resources to preserve Acadia’s beauty. George B. Dorr and Charles W. Eliot, a former president of Harvard University, saw danger of development and acted to avoid them. John D. Rockefeller, Jr., also played a critical role. He built the carriage roads and gave more than 11,000 acres, about one-third of the park’s area, to what became known as Acadia National Park. Since 1986, the park has purchased small tracks of land and easements to define its permanent boundary and to preserve scenic values. Many landowners today continue in the tradition of the park’s founders by placing easements on their property that limit development. The park encompasses 35,000 acres of beautiful seacoast, rocks, islands, forest, lakes and mountains for all to enjoy. Acadia is among the top 20 most visited National Parks and the majority of park visitors come in the summer and early fall. Acadia, as the name suggests, was French before it was English and then American. French frigates hid from English men of war in Frenchman Bay, screened from detection by the Porcupine Islands. The French and English battled for possession of North America from 1613 until 1760. French explorer Samuel Champlain sailed into the Bay in 1604 and named this Mount Desert Island because of its landmark bare top. The sea encircles the island, thrust inland, and often generates sea smoke and fog. In the midday sun its bright blue surface is studded with lobster buoys. In fog all is gray and muted. Somewhere out at sea, engines may mutter, but the lobster boat is blurred or lost in a formless world. Seen at sundown from Cadillac Mountain, the sea glows in soft pinks, mauve and gold. Gulls wing silently home to distant islands, and, like fireflies, navigational aids flash warnings from reefs, islands and headland. Between the sea and the forested mountains is the small, fascinating, almost nether world of the tidal zone. Twice daily exposed to air and drowned by sea water, it is a world of specially adapted organisms. Tidepools, pockets of seawater stranded in rock basins, are microhabitats brimming with life and exposed to view. In these natural aquariums you can watch marine animals going about their business. This zone of life occurs between low and high tides that average 11 to 12 feet. It is the primeval meeting place of earth and water. Wheelchair accessible restrooms are located at Sieur de Monts Spring, Fabbri and Bear Brooks Picnic areas, the Thompson Island Information Center, Blackwoods Campground, Seawall Campground and picnic area, and Park Headquarters. Some trails, restrooms, and campsites are accessible. Sign language interpreter provided with two weeks notice of arrival, if funding is available. Script for audio visual presentation at visitor center available upon request. Bicycles are not allowed off-road or on hiking trails. Some park carriage roads are open to biking. Wear a helmet, obey all biking regulations, dismount from your bike when approaching horses and signal when approaching other riders or walkers from the rear. Boat operators offer rentals, charters, cruises, and ferry service in nearby towns. More information may be obtained at the visitor centers. Park carriage roads are open to walkers, equestrians, and bicyclists. Some routes are closed to horses. Others extend onto private lands, and these are closed to bicyclists. Carriage tours are available at Wildwood Stables. Yield to others. Don’t obstruct the entire carriage road when you ride or walk. Move to the side when stopping or taking a break. Be prepared to stop. Stay in control. Gravel surfaces are loose, quick stops are dangerous. Let sight distance, traffic, and conditions govern speed. Dressfor the weather and carry water. Use a map. Sign posts at carriage road intersections have numbers on them. Horses can occasionally be unpredictable. Move to the side and let them pass. Do not startle them. Cyclists: wear a helmet, and when approaching others from behind, call out or use your bell. Leave no trace. Carry out what you carry in. There are two campgrounds in Acadia National Park. You can make reservations for Blackwoods campground only. Seawall Campgrounds operates on a first come first serve basis. Campgrounds normally fill early in July through September, so plan to arrive early. All park campsites are situated in woods, within a 10 minute walk of the ocean. One vehicle, six people and two small tents or one large tent are allowed at a campsite. Designated campsites accommodate trailers up to 35 feet. Neither campground has utility hook-ups. From early spring to late fall, the campgrounds provide restrooms, cold running water, dump station, picnic tables, fire rings and water faucets. Showers and a camping supply store are within .5 mile of both campgrounds. Blackwoods remains open during the off-season. Facilities are limited to picnic tables, fire rings, pit toilets and a hand pump for drinking water. During Jul and Aug, trout and salmon are found deep in the cooler waters of lakes and ponds on the Mount Desert Island. Special fishing gear often leads to greater success in catching cold water species in the summer. In cooler seasons, trout and salmon can be readily caught using common methods. Warm water species can be caught in several lakes and ponds throughout the year using common methods. Food and supplies are available in nearby towns. Arcadia has many foot trails, from lowland paths to mountain routes. They range from the casual walker to the avid hiker. There are 120 miles of hiking trails and 45 miles of carriage roads for walking and biking. Park lodging is limited to two campgrounds. Blackwoods campgrounds takes reservations. Seawall campgrounds is first come first serve. Plan on making your reservations as soon as possible. There is local campgrounds and lodging in the nearby communities. For fresh water fishing, a local Maine fishing permit is required. You can buy a one day or several day license. For salt water fishing, no license is required. Pets must always be attended and under physical restraint (max leash length 6 feet). Pets are not allowed on ladder trails, beaches, inside public buildings, or on ranger programs. Within the park, there is a 27 mile drive on Park Loop Road, which encompasses shoreline, forest and mountain scenery. A cassette tape tour is available for rent or purchase at the visitor center. There are ranger-led programs, hiking, biking, shore exploration. There is ice fishing, snowmobiling, winter hiking and cross-country skiing in the winter. See the Calendar Page for more information. Summers are generally warm, cooling off at night, sometimes dry, sometimes rainy. Winters are very cold and snowy. Always be prepared for cool weather, dress in layers.